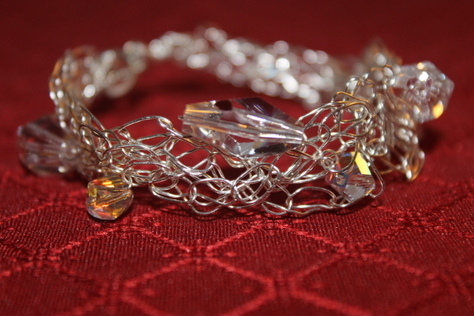 From Donna's Delites, this romantic clear Swarovski crystal bracelet showcases variation of clear crystals glittering across a silver wire band braided with a non-tarnish silver wire and finished on each end with a silver-tone toggle clasp, design with fantastic results. Perfect for those times when you want to make a dreamy and sentimental statement. All pieces are designed by hand, therefore no two items are identical. That's the beauty of buying handmade. The length is 9 inches and the condition is new. This item will need insurance added to shipment.